Lights, camera, action! Milan's stylish crowds are not shy when it comes to debuting their new-season clothes. If you're after a full Gucci look, a riot of colour and prints or an all-out madly luxurious getup, then this is the fashion mecca for you. The runway shows in Italy have fired up following London Fashion Week, and the industry is in place to showcase the most outré autumn outfit ideas. 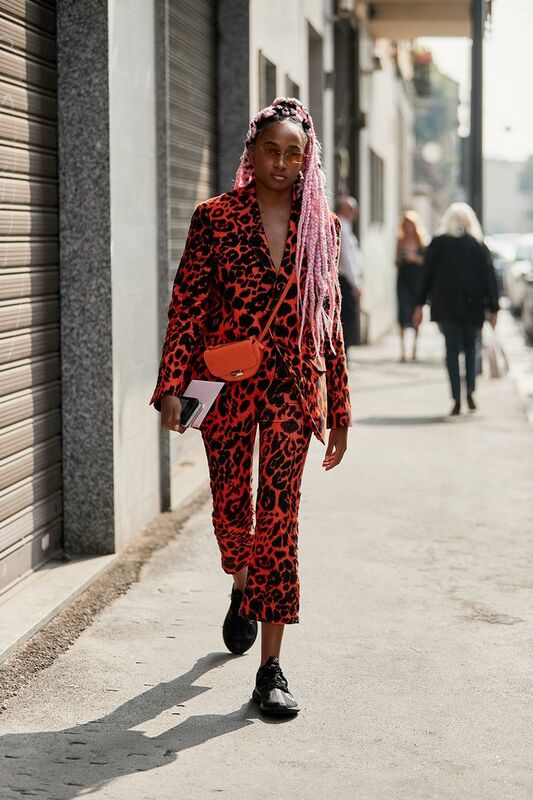 From Candela in a royal-blue satin gown with sneakers to Eleonora in jumbo leopard print and Tiffany in one of many jazzy jumpsuits she owns, we've cherrypicked the most "look at me" ensembles from the city's best dressed. These looks will make you take a break from reality and become immersed in the fantastical world of Milanese style. Forget minimalism—Italian ladies know maximalism is in. Double-red leopard print? Why not? 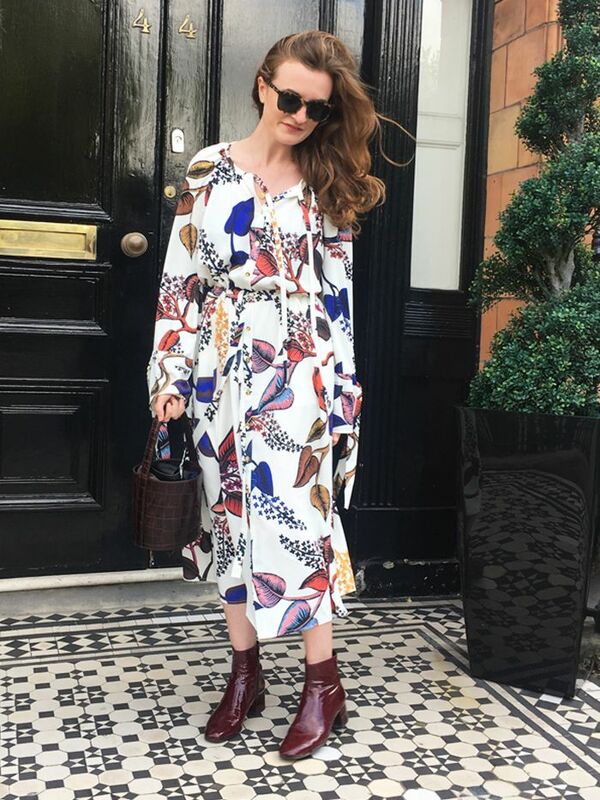 You can get mileage out of summer dresses with black ankle boots. Autumnal weather means sweaters and sandals, and we love it. These sandals from The Row have been everywhere. We're so trying cornflower blue and mustard together some time. Thanks for the tip, Ada Kokosar. Anklets and statement ankle straps are becoming a trend in their own right. A very smart way to do athleisure. A little bit '80s, but made modern with the black jeans. Honeypot bags are just the cutest. Milan's crowd has really embraced the tonal brown-on-brown dressing idea. When it doubt, throw a load of Gucci logos on and go forth into the world. Cow print is for the girl whose bored of leopard already. Logos and animal prints are a popular combo in Milano. You can't deny it any longer. Cowboy boots are growing on you, right? Leopard is great with neutral accessories. We agree, Eleonora. Take a sec to look at that bag. Trouser suits have became a staple part of editors' wardrobes during fashion month. Tiffany in yet another brilliant jumpsuit. Leather, blouson and a bit retro. This one is bold yet so comfy looking. Caroline Issa being understated and chic, as per usual. White go-go boots have also been in favour with Scandi girls recently too. Joseph's scarf jumper is another item we've spotted in multiples. Hands up if you really want some python-printed jeans. The Italian way to wear a gown in the day: add sneakers. This neutral canvas allows the tiger-printed bag to do all the talking in Gala's outfit. Is it a skirt, a pair of trousers or both? Who knows? We do know we like it, though. Harem pants actually never looked so alluring. This Burberry coat will be a collectors' item one day. Pretty skirts worn with grungy tees is an easy combination to copy. We're enjoying Susie Bubble's neon Prada look immensely. The top is quilted, so it could double up as a cosy blanket for a midafternoon nap. Subtle outfits call for crazy sunnies. Here's Susie in yet another fantastical highlighter-pink ensemble. Boxy shirts make sassy prints that little bit cooler. Next up, the high-street wish lists of our influencer pals.